Fakulti Sains Komputer dan Teknologi Maklumat terletak bersebelahan dengan tasik yang berada di Pintu Utama UPM. Fakulti ini terdiri daripada empat jabatan iaitu Jabatan Multimedia, Jabatan Sains Komputer, Jabatan Kejuruteraan Perisian dan Sistem Maklumat dan Jabatan Teknologi Komunikasi dan Rangkaian. Application is fully online. Admission for February and September intake, application is open throughout the year. We are offering Master of Computer Science, Master of Information Security and Master of Software Engineering. Please click here to download more information regarding our graduate studies program (master by coursework). Click here for more information regarding our PhD and Master programme (without coursework). Since 1971, the UPM Alumni list has grown to an impressive list of 145,000 people - not only in Malaysia, but from all over the world, including Australia, Iran, France, Myanmar and Saudi Arabia. Armed with a desire to foster fraternity with their Alma mater, UPM Alumni have managed to share great ideas and speak critically for the development of a dynamic university in the realisation of our vision and mission. Universiti Putra Malaysia (UPM) is a vibrant institute of research and learning that stands in lieu of servicing the nation's interest. As a world-renowned research university, UPM seeks to achieve the highest levels of distinction in the discovery and transmission of knowledge and understanding. Besides UPM’s distinctiveness in its commitment to undergraduate teaching and research, the University is proud to be globally regarded as one of the universities with such a green and natural learning environment. Today, more than 5,000 faculty members instruct approximately 18,000 undergraduate students and 10,000 graduate students. he nation’s and University's generous financial aid and sponsorship programmes ensure that talented students from all economic backgrounds can afford a UPM education. More emphasis has to be given to the conscientious use of information and communications technology as society becomes increasingly borderless. 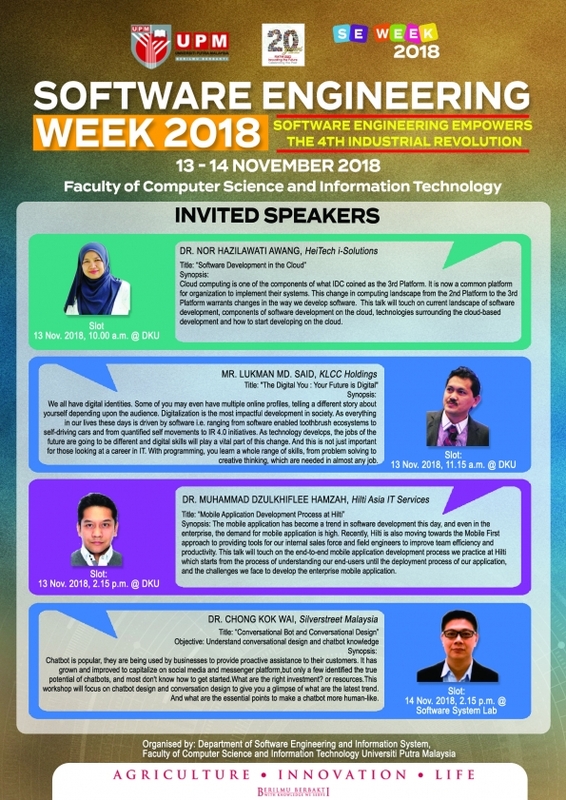 Deputy Dean (Development, Industry and Community Relations), Faculty of Computer Science and Information Technology, Universiti Putra Malaysia (UPM), Prof. Dr. Zuriati Ahmad Zukarnain received Distinguished Women Award in Computer Science in conjunction with the 4th Annual Women’s Meet (AWM) 2019 in Chennai, India.